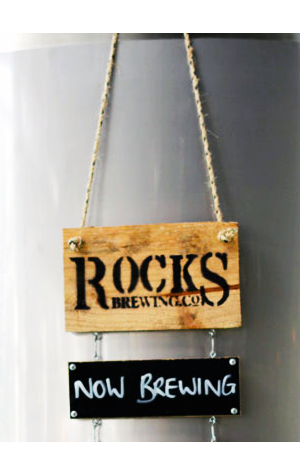 Unusually for a fresh hop beer, the story of Rocks’ Wet Hop Amber Rye Ale starts a year ago. Ben Landsberry, brewing BFF of Rocks head brewer Scotty Morgan for 10 years and current brewer at The Kernel in London (one of the driving forces in the British craft beer renaissance), had scored the promise of 50kg of fresh hops and pestered Scotty to get them for the just-opened Alexandria brewery. Scotty not only got the hops but went one better, giving them to Ben to create the brewery’s first specialty beer. Carrying on that theme for the 2015 version, Scotty has thrown the keys to one of his other brewers at Rocks, Kaine O’Regan, who has produced this Wet Hop Amber Rye Ale. It uses a mixed malt bill of Marris Otter, Rye, Carared and Melanoidin and a yeast that’s meant to be clean but accentuate the hop profile of a beer – and, of course, when it comes to fresh hop beers, that’s what you’re after. The hops used here are Galaxy and Ella, with the fruitiness of Galaxy hitting you full frontal on the nose while Ella’s slightly spicy character complements that of the pepperiness of the rye. It leaves you with a nice level of both bitterness and dryness, but it’s that first hop punch you’ll remember. For an interesting comparison, the brewery will be serving the new Wet Hop ale alongside a single keg of the previous year’s version, so that’ll be worth watching out for (if it hasn’t gone already…).